Even though my kids are getting older and Easter is no longer about the Easter Bunny we still celebrate like it is. Plus I make these goodies and pass them on to our sweet neighbors. 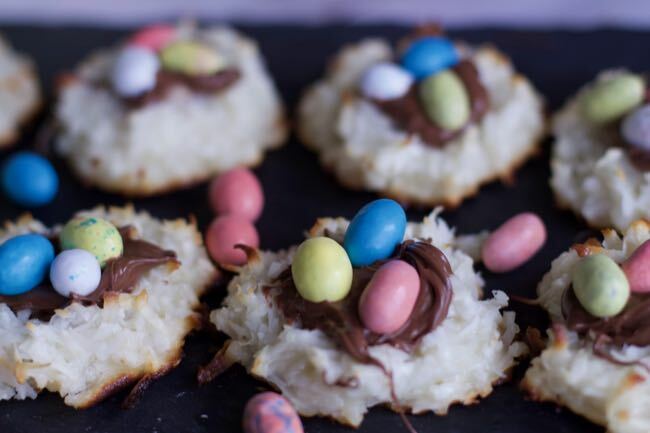 We have updated this Easter Cookies: -Easter Macaroons post with better pictures. 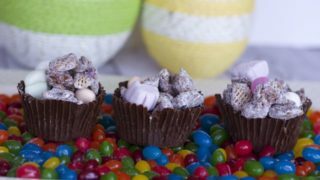 If you like coconut and chocolate then you will love these Super easy Easter Coconut Bird Nests. 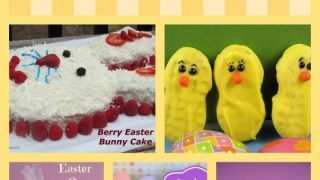 When I was looking for some fun new Easter treats on Pinterest last week, I found those cute Oreo chicks I made for my son’s teacher’s kids. 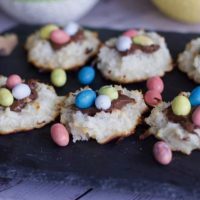 I also found Easter themed macaroons to make for the adults. 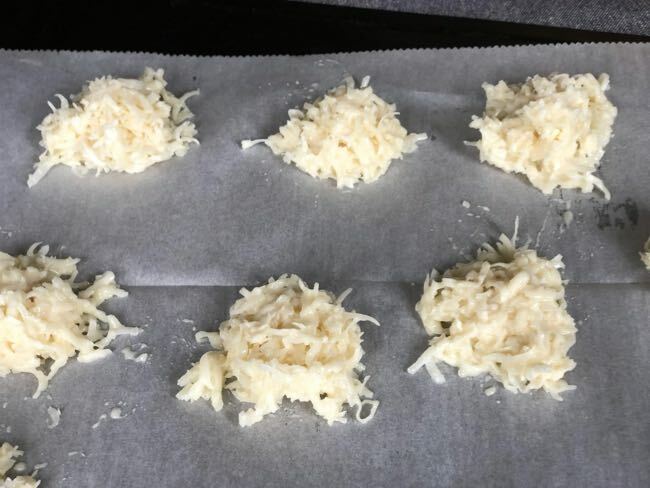 Macaroons are so simple to make, as long as you are not averse to coconut then these are a must make anytime of year. Simply dump all the ingredients into a bowl and mix well. That is how simple these are. 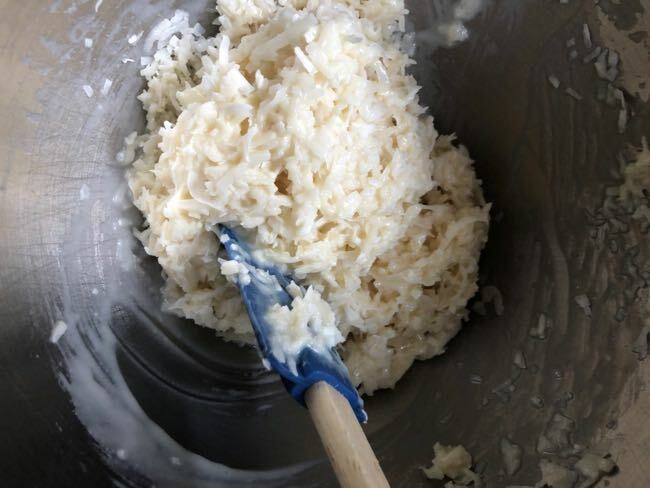 To make these macaroons even easier use an ice cream scoop to get even cookies. 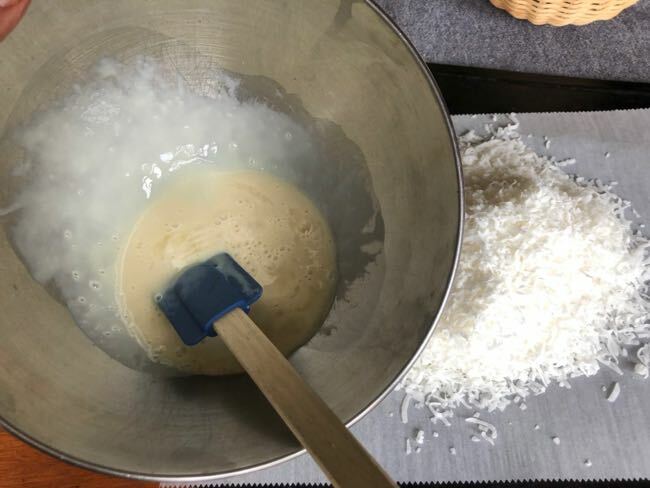 The recipe suggests 2 tablespoons but this way it is all in one scoop and you don’t have to get your fingers dirty in the process. I originally found these macaroons on Pinterest which used Nutella Filling. While this is a quick and easier filling, we made a hardened chocolate center or ganache instead. 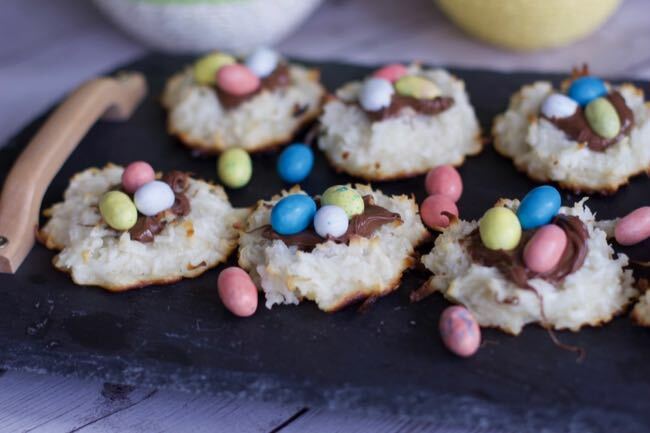 Let the Easter Macaroons cool completely before adding the filling. 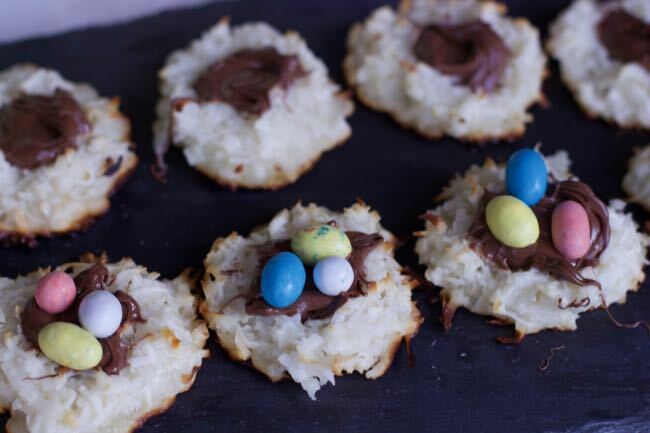 Spoon some chocolate into the centers of the macaroons. You could really just serve them like this anytime of the year. But its Easter, so top them off with the tEaster candy of your choice. 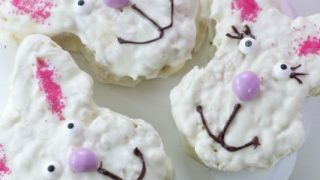 The kids can really make these simple cookies and they can especially help with the decorating. In my original post I also thought I would make some grass for some of them. I colored the some coconut green and sprinkled a little on a few cookies. 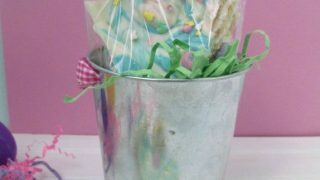 It is best to use a piece of wax paper in-between the layers when packing these easy cookies recipe so they don’t stick to one another. 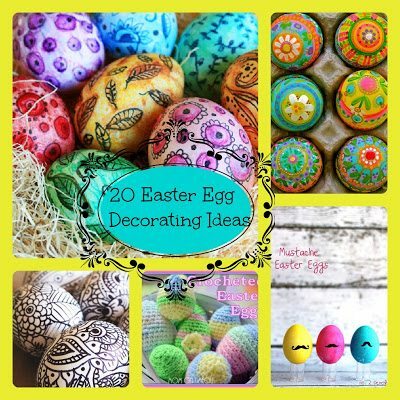 Pin this for when you are ready to start baking Easter Desserts. 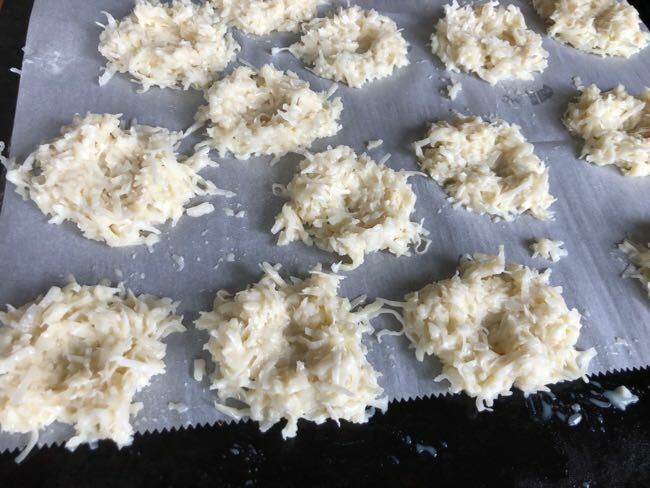 The perfect combination of coconut and chocolate in this easy to make cookie. 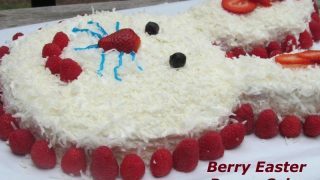 With an ice cream scoop, scoop up about 2 Tablespoons of the dough and place the dough onto the prepared baking sheet. Form the cookies into the shape of a bird nest. Press down the center with your thumb. Heat chocolate in microwave until mostly melted. Add whipping cream and stir until mixed well. Allow to cool a few minutes. Macaroons are delish and those are cute! So very cute! 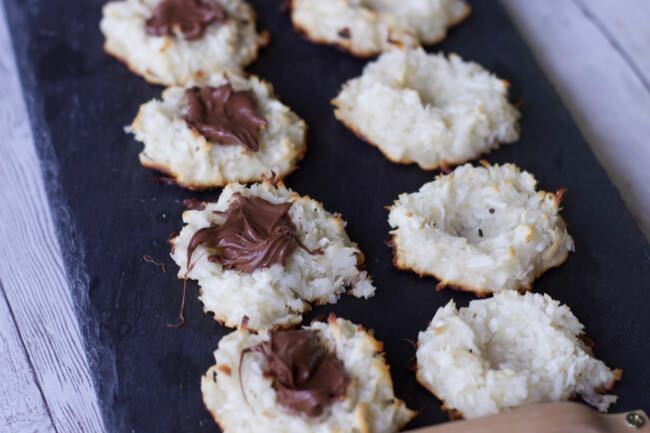 I love macaroon cookies– and with chocolate, that would be awesome! I found your blog through the blogger comment club – thanks for letting me visit. 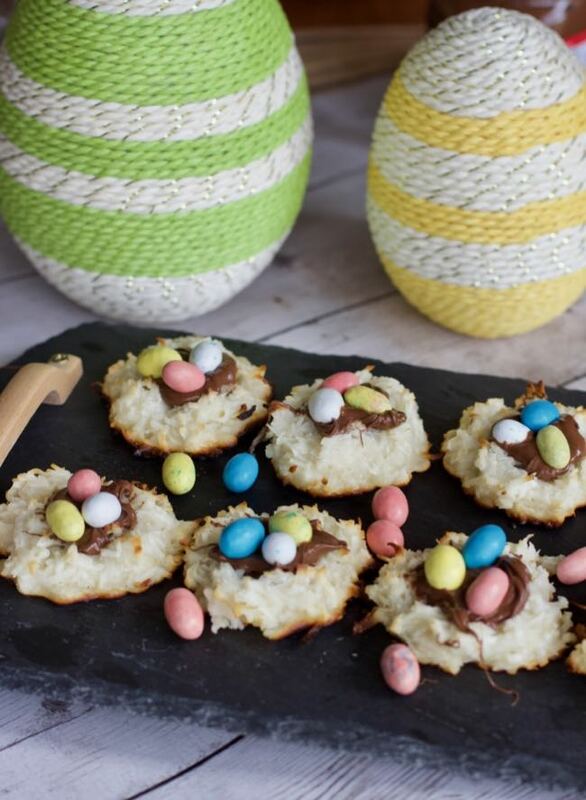 I think I need to make these little nests for my hubby … he is a macaroon lover!